Ideal for powering critical applications, the Dell PowerEdge R410 server is high-powered and sturdy. This Dell server is a wonderful pick for crunching numbers and powering applications. Startups and researchers are amazed by the scalability and hardware of the Dell PowerEdge R410 server. The high-performance 2.4 GHz Xeon CPU found on this server enables you to run multiple tasks, host applications, and stream multimedia videos all at the same time. As the Dell PowerEdge R410 server features a hard drive, you can count on having more than enough storage space for database tables, digital images, and document repositories. You can benefit from increased system performance when serving up shared file storage solutions, enterprise applications, or Web services because this Dell server features 6 GB of DDR3 SDRAM. Plus, since this server comes in a rack-mountable form factor, you can make use of it in your computer room or server farm with relative ease. 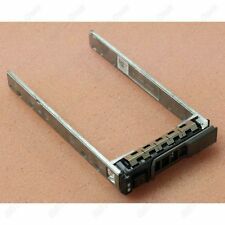 Dell KG7NR/G176J Drive Bay Caddy - 2.5"